I have created this layout using 2 sheets of the same patterned paper to demonstrate how the page can be decorated by cutting out and using shapes as raised embellishments on top of a base page. This layout was created using two sheets of Chatterbox Sun Sunburst Sky paper, blue cardstock, Chipboard cut out "Dad," craft wire, MM eyelets (blue, pink and aqua), yellow buttons, white letter tags, MM "Rummage" magnetic stamps, black ink, Magic mount, super tape, needle, thread and Bazzill Moments Textured stickers. Begin by creating your title "Dad" title. Cut a piece of Chatterbox Sun Sunburst Sky paper slightly larger than the chipboard. Apply glue to the top surface of "Dad" and adhere to the patterned paper so that the reverse side is visible. Allow the glue to dry and trim away the excess paper from around the letters leaving approximately a 3-5mm overhang. Using a sanding block, sanding stick or sand paper gently rub along edges of the letters to remove over hang. Work from front to back to avoid peeling the patterned paper off. For a distressed effect lightly sand the front of the word. Mat with blue cardstock to create a border approximately 2-3mm around the word. Mat your photos with blue cardstock and adhere to your background piece of Chatterbox Sun Sunburst Sky paper, as shown in the layout above. Thread wire through the holes in letter tags. Hold the wire in place with super tape on the back. Adhere the letters across the top of your page. Set aqua eyelets on either side of your letter tags, as shown in the layout above. Thread ends of wire through to the back and secure in place with super tape. Position and adhere Bazzill Moments Textured stickers as shown in the layout above. 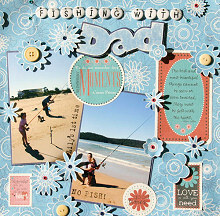 Adhere "Dad" cut-out with Magic Mount, as shown in the layout above. Use black ink to stamp wording directly onto your photos. Cut out flowers from the remainder of your second sheet of patterned paper. These will be used as raised embellishments. Set blue & pink eyelets in flowers which have a small circle in the centre. Sew buttons to the centre of some of the larger flowers, as shown above. I have used yellow to compliment the colour of the sand and because they seem to make the flowers look like pictures of the sun. Using either 1, 2 or 3 layers of Magic Mount under individual flowers attach them to layout over the corresponding flowers on the base page for a raised effect.